People sometimes mock Belgian playwright and theatre director/legend Jan Decorte, for the so-called simplicity of his texts and the plays he brings to the stage. Buy a ticket for Oedipus/bêt noir, the newest piece by renowned Belgian choreographer Wim Vandekeybus, and you’ll see: Decorte’s work is far more clever than you’d think and it really isn’t that easy to cover (if you allow me to borrow a term from the pop world). 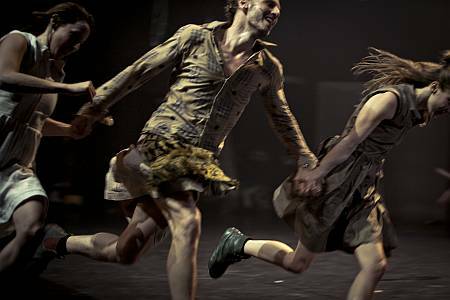 I left the theatre (KVS, Brussels) with mixed feelings: the dance sections often are quite powerful and beautiful, Vandekeybus comes up with some strong visual images, but actors (and director) are struggling with Decorte’s text and don’t seem to have found the right path that would lead them to a really convincing performance.